Myntra Big Billion Days 2015 Sale Details With Date - Myntra is offering India's Biggest Fashion Sale during Flipkart's Big Billion Sale Big Billion Day Sale 2015 date. 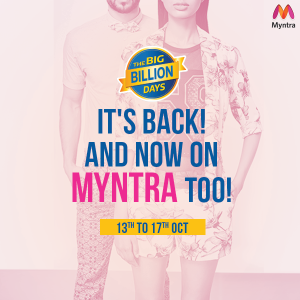 Myntra Big Billion Days Date 2015 - October 13, 2015 to October 17, 2015. How to avail Myntra Big Billion Day Sale Offers? 1. Download Myntra app if you do not have it already. Myntra is available only as app. 2. Shop during the Myntra Big Billion Days. 1. Offer would be over 2 lakh styles. 2. Discounts up to 60%. 3. First time customers of Myntra can enjoy free shipping along with few other offers including cashback offers. 4. Myntra sells only 100% authentic products. 5. Myntra has Cash On Delivery option and 30-Days Exchange/Return Policy.